GALION — Kaela Downey has been crafting for as long as she can remember, and now the 2010 Northmor grad is turning her hobby into a new Galion business. As a kid she was always making or doing something crafty, and her enjoyment continued into early adult life. As a young adult with no kids of her own, she would go to scrapbooking events with friends and end up working on scrapbook pages for other people just to “get her fix” while helping someone at the same time. Now, as a wife and mother, she has decided to turn her passion for crafting into a business after a whirlwind year of success she never could have anticipated. After purchasing a Cricut machine to help with her love of scrapbooking, Kaela started to explore other options for crafting. She settled on vinyl heat transfers and started making custom designs for shirts for herself and for friends. Last year, a family member gifted Downey with a heat transfer machine that made her process for creating even easier. Instead of using a household iron to apply the vinyl after it had been cut out, she was now able to lay it out and apply the transfer all at once. “My relative just asked me to pay them back with a dime from each shirt that I sold, and I did it in less than a year,” Downey said. When her son started pre-school last fall, Kaela made him a shirt to wear for his first day. Soon after, at the urging of family and friends, she set up a Facebook page just to see what would happen. From that, ‘Dear Downey’ was born and has taken off bigger than Kaela ever could have hoped. In November of 2017, Downey decided to attend a “Business Boutique” seminar in Tennessee now offered by nationally known Financial Peace guru Dave Ramsey. “The first day of the seminar, we were asked to list a goal we had for ourselves in the next five years. I wrote that I would like to have my own store front, and the next day my phone rang with that very opportunity,” said Downey. 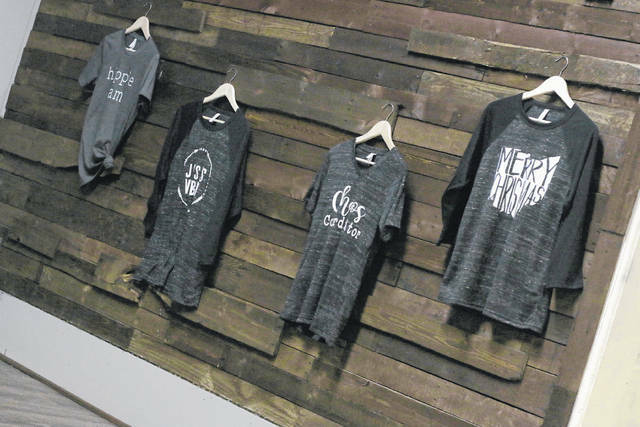 New flooring, fresh paint, and a handmade pallet wall have brought much needed new life to the store that is the new face of Dear Downey in uptown Galion. Located right beside The Topia Boutique, Dear Downey has a prime location for success and Downey is planning to seize every opportunity she can. Downey opened her doors for the first time last Saturday in conjunction with the Come Home to Galion celebration, and she was overwhelmed by the response. “My shelves were full, and now it looks empty in here! We sold more than I ever expected,” Downey said. With her official grand opening scheduled for Jan. 26, Dear Downey is currently open by appointment only as Downey works to prepare the store for regular business. Primarily focused on custom designed shirts and gifts, Dear Downey will also offer decor items like signage and mugs. Downey currently plans to offer business hours of Monday, Tuesday, Thursday, and Friday 10 a.m.- 7 p.m. and Saturday noon to 5 p.m.
Galion’s newest retailer Dear Downey plans to open January 26 at 107 Harding Way East just off the Public Square. Offering custom clothing and gifts, the store will be a fresh addition to the growing shopping opportunities in uptown Galion. https://www.galioninquirer.com/wp-content/uploads/sites/38/2017/12/web1_IMG_6359.jpgGalion’s newest retailer Dear Downey plans to open January 26 at 107 Harding Way East just off the Public Square. Offering custom clothing and gifts, the store will be a fresh addition to the growing shopping opportunities in uptown Galion.